3.8 out of 5 based on 41 bloggers and 3 commenters. 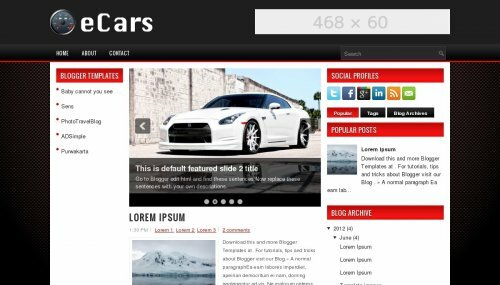 eCars is a free blogger template adapted from WordPress with 3 columns, left and right sidebars, ads ready, footer columns, slider, social bookmarking icons, posts thumbnails, tabs, drop down menu and well designed threaded comments. thanks your proffesionaly Blogger help all newby blog.